Friday September 3rd 1909 I was sick most of the night and Dr Smith came out at 6.30 to see me. I slept all day long. Will only rousing me long enough to give medicine. I got up to eat a little supper. Saturday September 4th 1909 I felt some better but was in bed most of the day. Will went to town in the afternoon. I got up after he came home and did a little necessary work and laid on the lounge till 8 oclock. My gloves came that [M? Nerper?] sent from Seattle. 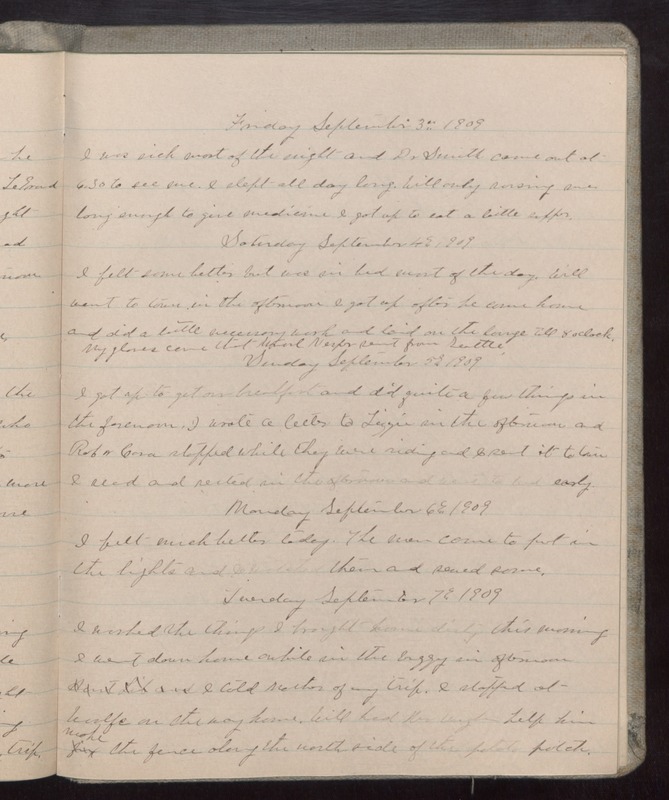 Sunday September 5th 1909 I got up to get our breakfast and did quite a few things in the forenoon. I wrote a letter to Lizzie in the afternoon and Rob & Cora stopped while they were riding and I sent it to town I [recd?] and rested in the afternoon and we went to bed early. Monday September 6th 1909 I felt much better today. The men came to put in the lights and I watched them and sewed some. Tuesday September 7th 1909 I washed the things I brought home dirty this morning I went down home awhile in the buggy in afternoon I told Mother of my trip. I stopped at Woolfe on the way home. Will had Mr Vaughn help him make the fence along the north side of the potato patch.